So the left can turn a decades-long blind-eye to Harvey Weinstein’s sexual abuse of countless high profile women, but when a teenage conservative shares his views, he gets ostracized . . . Sounds about right. 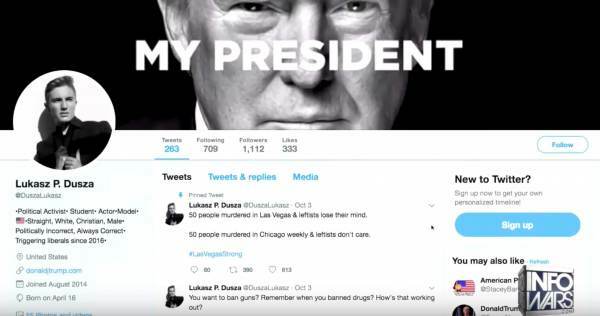 Lukasz Dusza, a 17-year-old aspiring actor, claims that not too long ago he was given an opportunity to work with an agency that represents entertainment industry talent and says that “during this time, [he] developed a presence on social media” wherein he began sharing his political views. The agency, however, did not like this and more specifically, they disliked the photo that Dusza shared on Facebook of President Trump with a caption that read: “My President”. Just last week, Dusza says that he was informed that his contract had been terminated due to his “polarizing views”. He points out that, to the left, conservative views are considered “polarizing”. He then goes on to say that none of this would have happened had he encouraged “blowing up the White House” like Madonna did earlier this year. The agency said that they did not appreciate Dusza or the beliefs he had and that they did not have a place for him at their agency. It is extremely unfortunate and horrifying to think that a young man looking to gain footing in an industry is being blackballed due to his conservative beliefs.